Hello and welcome to the 421st installment of the SWD. Free Syrian Army arrested four four elements of the Islamic State, who escaped yesterday from a Free Syrian Army’s prison in the village of Shamarakh, north of Aleppo. The elements were arrested in Jabal Birsaya area north of Azaz, after clashes occurred between the Free Syrian Army and the elements. Two of the four elements were wounded in the clashes. Abu Amara Special Task Brigade stated that its improvised explosive device targeted a National Defense Forces’ headquarters in Al-Maadi neighborhood of the city of Aleppo. The explosion reportedly killed four elements of the National Defense Forces. Syrian Arab News Agency stated that an improvised explosive device killed two and wounded three civilians in Al-Maadi neighborhood. Hayat Tahrir al-Sham clashed with the National Defense Forces and allies in Al-Sawaghiya area close to Fuah and Kafraya pocket. Reports suggest that an element of the National Defense Forces was killed and several wounded in the encounter, while Hayat Tahrir al-Sham’s casualties are unknown. Turkish Armed Forces’ delegation, escorted by Faylaq al-Sham visited Bidama and Al-Najiya in Jisr al-Shughur region, as well as Jabal al-Akrad in northern Latakia, inspecting areas for the future establishment of an observation point in the region. The last seventh batch of evacuated rebel elements and their families from Yalda, Babbila, and Beit Sahem south of Damascus arrived at Qalaat al-Madiq crossing in western Hama. The batch reportedly consisted of around 130 rebel elements and civilians, who will be transferred to Saed camp in Idlib for internally displaced persons. Third batch of rebel elements and their families started evacuating from the Northern Homs pocket, towards northern Syria. Syrian Arab News Agency stated that more than 71 buses carrying fighters and civilians left the aforementioned localities towards northern Syria. 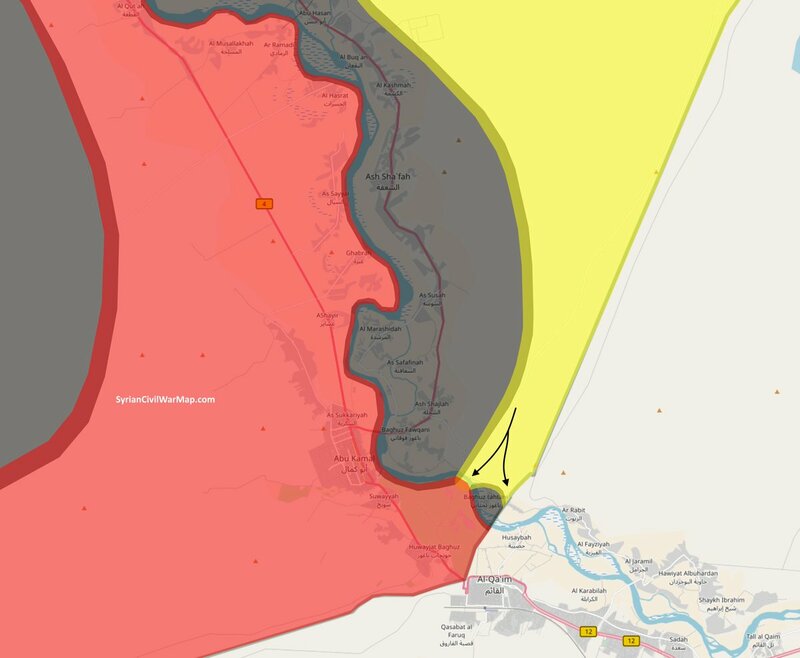 Syrian Democratic Forces made additional advances against the Islamic State on Al-Baghouz front, reportedly reaching the Euphrates river and surrounding the aforementioned village. 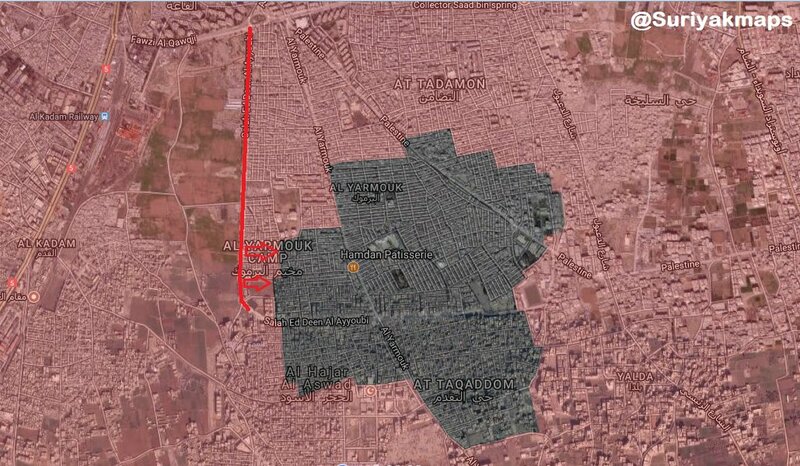 Syrian Arab Army and allies reportedly made advances east of the 30th Street in Al-Yarmouk camp against the Islamic State. Islamic State’s weekly Al-Naba newsletter stated that more than 640 elements of the Syrian Arab Army and allied militias were killed and dozens wounded in clashes with the Islamic State in southern Damascus, primarily in Al-Hajar al-Aswad and Al-Yarmouk camp. Syrian Internal Security Forces entered Yalda, Babbila, and Beit Sahem, after the remaining rebels and their families were evacuated from the localities. Islamic Emirate of Afghanistan (Taliban) overran an Afghan National Army’s checkpoint in Quriash area of Dawlat Abad district. Islamic Emirate of Afghanistan’s Al-Emarah News stated that ten elements of the Islamic State, including a commander defected to the group in Derzab district. The elements handed over five motorcycles, eight assault rifles, a PK machine gun, and large quantities of ammunition to the Islamic Emirate of Afghanistan. Afghan National Security Forces killed eight, wounded 14, and captured three elements of the Islamic Emirate of Afghanistan in Chimtal and Chahar Bolak districts, as well as in Tala wa Barfak district in Baghlan Province. Islamic Emirate of Afghanistan’s sniper killed an element of the Afghan Local Police in Shortepa district. Two elements of the Afghan Local Police surrendered to the Islamic Emirate of Afghanistan in Char Kand district. Islamic Emirate of Afghanistan overran and destroyed two Afghan National Army’s posts in Imam Sahib district. Four elements of the Afghan National Army were killed and two wounded in the encounters. Islamic Emirate of Afghanistan’s improvised explosive device destroyed an Afghan National Army’s vehicle, killing five soldiers in Ali Abad district. Islamic Emirate of Afghanistan seized five Afghan National Security Forces’ posts in Tagab district. Seven elements of the Afghan National Security Forces were killed and dozen more wounded in the encounters. Islamic Emirate of Afghanistan repelled and counterattacked an Afghan National Security Forces’ offensive in Dushi district, killing five and wounding seven elements in the process, as well as destroying five armored vehicles. Four elements of the Islamic Emirate of Afghanistan stormed a National Directorate of Security’s building and an Afghan National Police’s station, conducting suicide attacks shortly after storming the aforementioned buildings. Islamic Emirate of Afghanistan’s Al-Emarah News stated that more than 20 elements of the ‘National Directorate of Security’ were killed in the attacks. Afghan National Security Forces killed nine elements of the Islamic Emirate of Afghanistan and four elements of the Islamic State, as well as wounded 11 former’s elements in Deh Bala (Haska Mayna) and Bati Kot districts of Nangarhar, and in Alingar district of Laghman Province. Islamic Emirate of Afghanistan killed two elements of the Afghan National Army in Jalrez district. Islamic Emirate of Afghanistan attacked an Afghan Local Police’s post in the city of Pol-e Alam, capital of Logar Province. Four elements of the Afghan Local Police were killed in the encounter. Islamic Emirate of Afghanistan’s improvised explosive device targeted an Afghan National Army’s armored vehicle in Baraki Barak district, killing three and wounding one soldier. Afghan National Security Forces killed three elements of the Islamic Emirate of Afghanistan and two elements of the Haqqani Network, as well as wounded five former’s elements in Ghazni, Paktika, and Logar provinces. Islamic Emirate of Afghanistan ambushed elements of the Afghan National Army in Andar district, reportedly killing seven soldiers and destroying two armored vehicles. Separately, an Islamic Emirate of Afghanistan’s improvised explosive device destroyed an Afghan National Army’s armored vehicle, killing three and wounding two soldiers in Andar district. Islamic Emirate of Afghanistan attacked an Afghan Local Police’s post in Surobi district, killing four and wounding three policemen in the process. Islamic Emirate of Afghanistan overran an Afghan National Army’s military base along Herat – Kandahar road in Dorahi area of Farah Rod district. Islamic Emirate of Afghanistan’s Al-Emarah News claimed that 27 elements of the Afghan National Army were killed and several wounded in clashes for the base, as well as four armored personnel carriers, a Kamaz truck, and a weapons depot destroyed. One element of the Islamic Emirate of Afghanistan was killed and two wounded in the encounter. Islamic Emirate of Afghanistan seized four armored personnel carriers, a Kamaz truck, two PK machine guns, two RPG launchers, and 12 assault rifles from the base. Islamic Emirate of Afghanistan’s snipers killed two elements of the Afghan National Army and an element of the Afghan National Police in Khas Urozgan and Deh Rawud districts. Islamic Emirate of Afghanistan overran three Afghan National Security Forces’ checkpoints in Arghandab district. Islamic Emirate of Afghanistan’s Al-Emarah News claimed that 31 elements of the Afghan National Security Forces were killed, two pickups destroyed, and 15 assault rifles seized in the encounter. One element of the Islamic Emirate of Afghanistan was killed and another wounded in clashes. Islamic Emirate of Afghanistan overran an Afghan Local Police’s checkpoint in Tangano Godar area of Nawa-I-Barakzayi district. Seven elements of the Afghan Local Police were killed in the encounter, while the remaining elements withdrew from the checkpoint. Islamic Emirate of Afghanistan seized four assault rifles and an RPG launcher from the checkpoint. Afghan National Security Forces killed nine and wounded five elements of the Islamic Emirate of Afghanistan, as well as destroyed several weapons depots and ammunition caches in Maywand district. One of the nine killed elements was Islamic Emirate of Afghanistan’s commander, Ahmad Shah. Islamic Emirate of Afghanistan overran an Afghan National Army’s checkpoint in Basi area of Spin Boldak district. Four elements of the Afghan National Army were killed in the encounter. Islamic Emirate of Afghanistan seized two PK machine guns and two assault rifles from the checkpoint. Islamic Emirate of Afghanistan assassinated Afghan National Army’s commander, Bismillah in the 4th Police District of the city of Kandahar. Afghan National Army’s commander, Maghfoor and another element of the army defected to the Islamic Emirate of Afghanistan in Samchak area. Between the 4th and the 10th of May 2018 CJTF-OIR has conducted 46 strikes in Syria. CJTF-OIR‘s main focus in Syria at the moment is Deir al-Zour-Albu Kamal region where they did 39 strikes supporting SDF‘s operations against IS destroying one IS supply cache, two supply routes, two IED factories, a vehicle storage facility, two IS weapons caches, one logistics hub, one IS staging area, one IS-held building, one command and control center, three IS VBIED factories, one IS IED belt, and one IS artillery piece. Other area where six strikes occurred is Al-Shadaddi, destroying destroyed a vehicle, an IS security post, an IS fighting position, a mortar position, and four VBIED factories. Full report on CJTF-OIR strikes conducted in both Syria & Iraq can be found here.